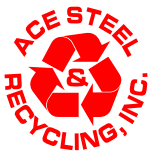 Ace Steel & Recycling - Ace Steel & Recycling Inc. Ace Steel & Recycling is a strong leader for recycling in South Dakota. We operate facilities in Rapid City and Pierre, where we buy, process, and ship scrap iron, automobiles, stainless steel, and aluminum, including cans and cast. We also buy insulated wires as well as copper, brass, lead, batteries, zinc, and tungsten carbide. We offer roll off and lugger bin service in the Rapid City. Check our site out for information specific to the materials you want to bring in. Questions? Call us at (605) 342-8649. Our goal is to make recycling your materials so quick, easy, and profitable that you'll become a lifetime recycler! Be part of the solution, with Ace! Sheets, plates, angles, channels, pipe, tube - both round and square, solids - both round and square, flats, expanded metals and more. In both steel and aluminum, all at competitive pricing. We offer plate shearing up to 1/2 inch and press brake service up to 3/8 inch. We also offer CNC Plasma burning up to one inch and CNC torch up to 6 inch. Recent additions include a new four roll plate roll capable of rolling 1/2 inch x 96 inches and 3/4 inch to 48 inches all to a 20 1/2 inch diameter. Whatever your project might be, Ace Steel & Recycling can help with quality steel and aluminum at competitive pricing!